We have been travelling the global poker circuit since 2005 to bring you the most colourful and exciting live reporting from our expert team. 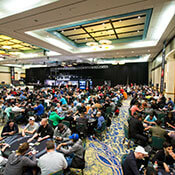 PokerStars Blog is on the ground at every major tournament, including the EPT, PCA, APPT, WSOP and more. You can expect behind-the-scenes insight from the world of high stakes poker, world-class photography and exclusive video features alongside live video streaming from the year’s major events. We can’t promise to take you around the world with us, but we can bring the live poker world to you. PokerStars LIVE is adopting the Tournament Directors Association rules moving forward for all its events. The first PS LIVE event to feature the new TDA rules will be EPT Sochi, and you can qualify this weekend on PokerStars to play in Russia later this month.